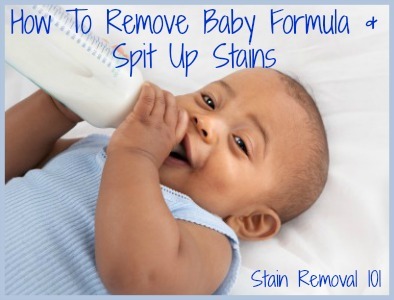 Further, the tips below focus on removing formula and spit up stains from clothing and other washable fabrics, such as bibs and burp cloths, but as you may know babies don't just spit up onto washable stuff. Instead, they also make a mess on upholstery and carpet. 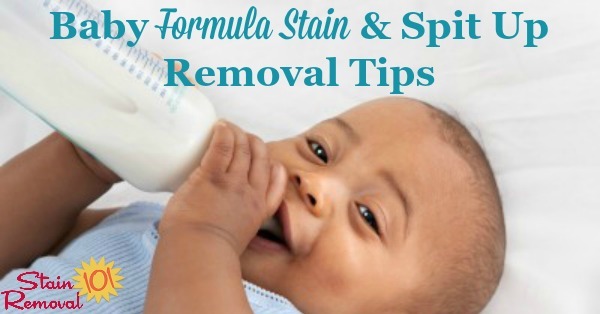 If you're searching for information for these surfaces make sure to check my article about removing formula stains here, which discusses how to remove them from carpet and upholstery as well. 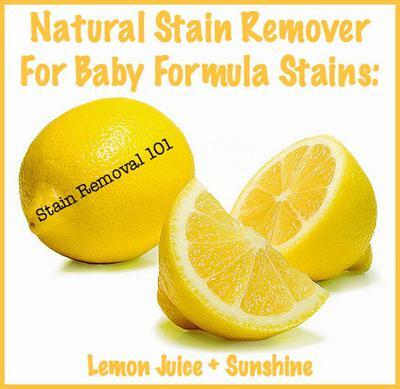 So scroll on down for lots of different tips, ideas, recommendations for various stain removers and natural and DIY remedies! I have used Carbona's stain devils #4 to remove baby formula from a jacket that was a dry clean only garment. I restrict my use of Carbona products to stains on dry cleanable items since they are fairly expensive. Thanks so much for the tip, because you're right, unfortunately babies don't just spit up and spill on washable clothing and other fabrics, but sometimes on things that can't be washed! If you're not familiar with this brand of stain removal products I've written an article about the 9 formulas available which are designed to combat different stains. 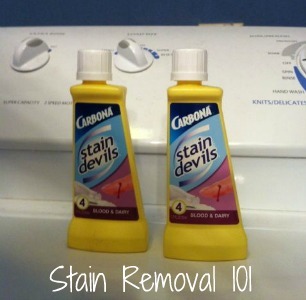 In addition, I've shared my own review of Carbona Stain Devil #4 here which I recommend for blood stain removal. 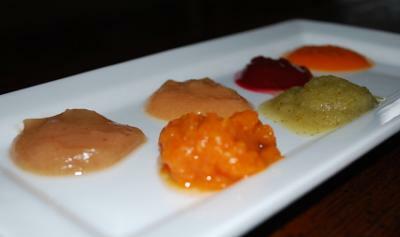 I like pre treating and pre soaking with a powdered dishwashing detergent like Cascade. 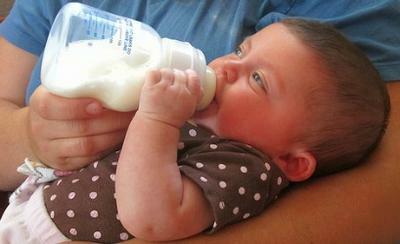 As my friend said you do not need to try a lot of pre treaters for formula stains. I would never have thought of using dishwashing detergent for laundry. I mix up a paste of the powdered detergent using cold water and apply it with an old toothbrush. Let it sit for about 10 minutes and then drop it into a soak bucket containing more dishwashing powder. I generally let them soak overnight, then dump the bucket into the washer and add detergent and wash as normal. I use All Free detergent. 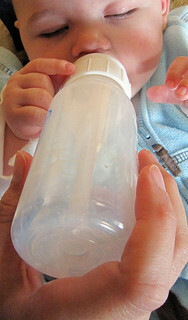 Baby formula stains are tough enough, but formula that contains iron supplements are an even bigger challenge. I use White Brite (referral link) as a pre soak for any white garments stained with formula that contain iron supplements (yellow stains). It is an awesome product. Just ensure that you follow the directions and don't throw in any colored garments as they will be destroyed. I buy this product at Walmart. One of my co workers told me to try it as she used it to get out iron formula spit up stains from her white tops. This is especially important when you work a job where white blouses are required! For colored garments with the same stains I pre soak with Biz powder, so far this is the best product I have found. 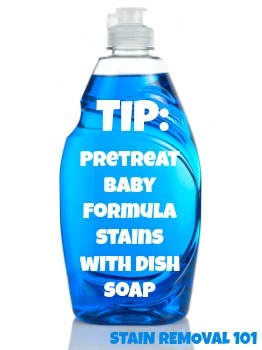 The most important thing about formula stains is to pre soak them, as it gives the best shot at getting them out. Also if pre soaking is not possible, as when you are away from your home it is best to pack a pre treater like Shout gel that has the scrub brush on top of the bottle. It really does help keep these stains from setting. How to pretreat a suit? 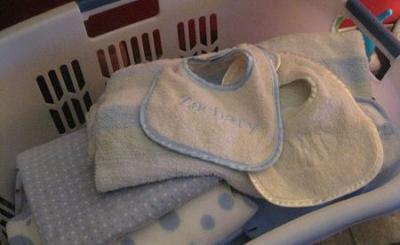 How to pretreat a man's suit to keep baby spit up from staining it? 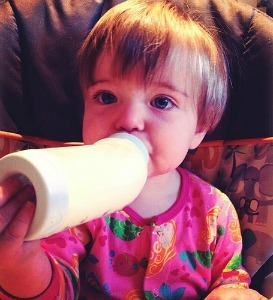 As far as pretreaters for formula stains the day care workers said that Shout Gel, Zout, and Whink are the best. Shout and Whink are favored because there is no problem leaving them on the stains for several days if needed, and it is always best to pretreat as soon as possible. Since they deal with different types of formula they also noted that Shout Gel and Zout work on most of these stains, but for certain ones Whink is the only product that does the job. 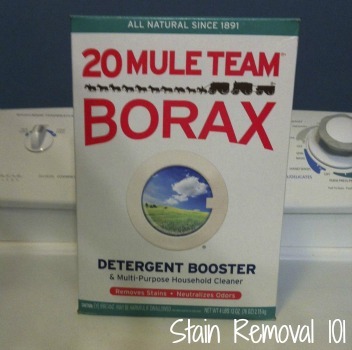 They also said that they, as well as their customers, use other laundry boosters for the wash and presoaking which include Borax, Oxi Clean,and Biz. They buy baking soda in the largest size available as it has various cleaning uses in their business beyond laundry. 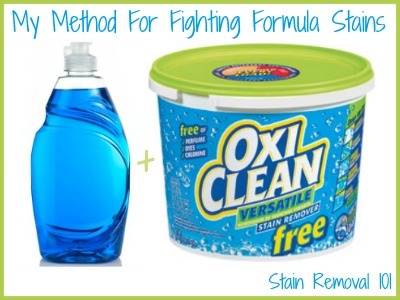 This works really well to remove formula stains on the few dry cleanable items I still own! The Daycare recommended this stain remover. 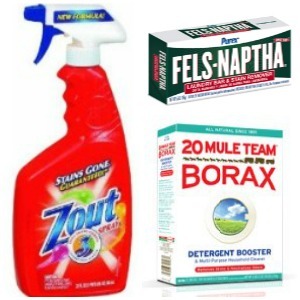 For all of the washable garments that have formula stains, as well as many other types of stains, I use Fels bar soap as a pre treater and BIZ powder as a booster and presoak. 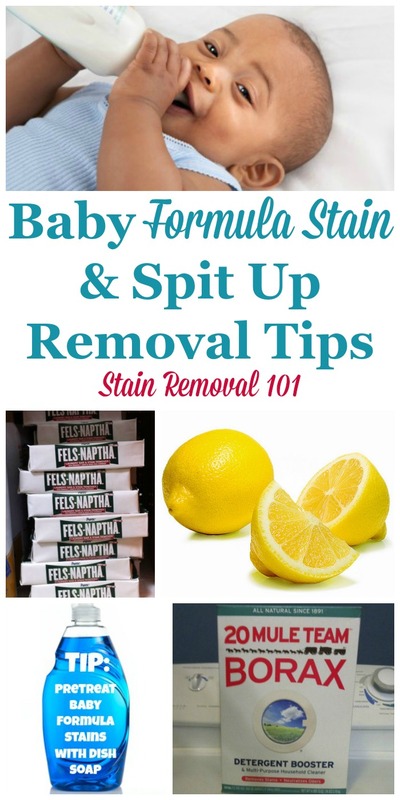 These products were also on the list of stain removers recommended by the Daycare. Both are reasonably priced and extremely effective. 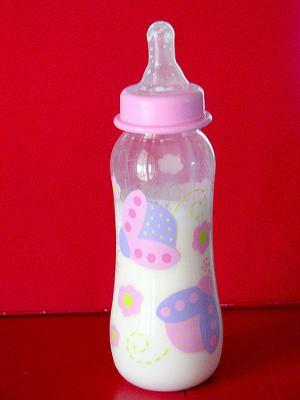 Note that presoaking is best when you have lots of stains, but avoid using hot water, especially when removing formula stains.